The baseball scorecard has a rich tradition of history. You shouldn't have to give that up just to be able to quickly assemble powerful stats and sabermetrics, and now you don't. All with the paper-and-pencil feel you're used to! 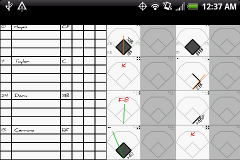 Scorekeeping is an art. There's a beautiful simplicity about a 9x9 grid of diamonds. Now with 6-4-3, you can keep the tradition with the look and feel of a paper-and-pencil scorecard with the convenience of a scorebook that fits in your pocket. Why should you have to learn a whole new scoring system? Some systems want to interview you about every play. With 6-4-3, though, you simply jot down what happened just like you would on your scoresheet. Use your finger to draw a line from home to first to second, and 6-4-3 records a double. And when the game is over, 6-4-3 isn't done. You've got a beautiful, legible, and perfectly kept scoresheet as a memento of the game. 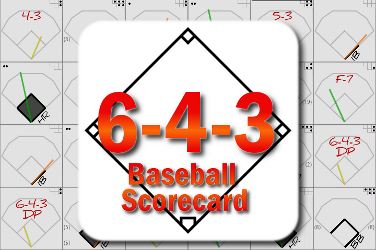 Show it off by posting your scoresheet directly to Facebook, e-mail it to your friends, or take it home to print it out. 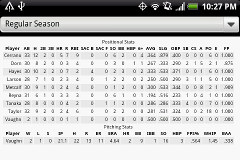 6-4-3 doesn't stop at stats, though. Let's talk about spray charts that can be filtered by the type of contact the hitter made and whether the ball went for an out or a hit. See your players' tendencies so you can coach them better, and see your opponents' tendencies so you can adjust. And it all fits in the palm of your hand, perfectly easy to use even if you're in the third-base coach's box! Whether you're a coach or a fan, 6-4-3 is designed to be the ultimate scorekeeping tool. If you can keep score on a scoresheet, you already know everything you need to to score with 6-4-3.